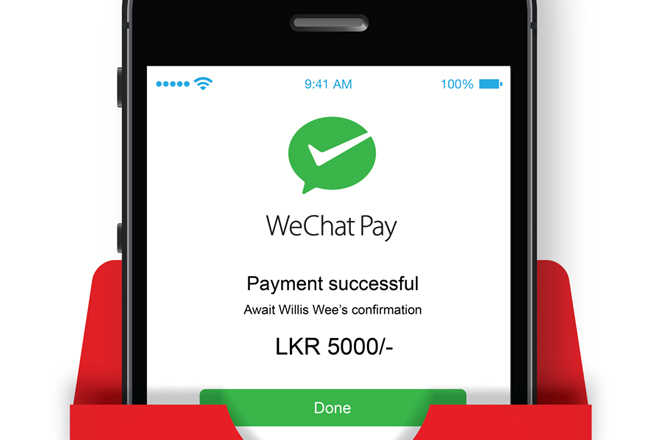 This mobile app solution is brought to the Sri Lankan market by Commercial Bank in partnership with Wells Digital Infrastructure (Pvt) Ltd., and SwiftPass Technologies Co. Ltd., a leading electronic payments solutions provider which facilitates Commercial Bank’s acquiring of ‘WeChat Pay’ transactions in Sri Lanka. Interested merchants can request the Bank to provide them with the special POS device. Once this is in place, visiting customers can choose multiple ‘WeChat Pay’payment methods to make payments through QR codes. This solution also enables them to view the value of their purchases and pay for them in Yuan or any major currency of their choice, without losing out on currency conversion rates, the Bank explained. ‘WeChat’ is a Chinese multi-purpose messaging, social media and mobile payment app developed by Tencent. It was first released in 2011, and by 2018 was one of the world’s largest standalone mobile apps with over 1040 million monthly active users and 600 million monthly active ‘WeChat Pay’ users, specifically. ‘WeChat Pay’ also sees 600 million daily transactions effected through its system. The only Sri Lankan Bank to be ranked among the world’s top 1000 banks for eight years consecutively, Commercial Bank operates a network of 266 branches and 830 ATMs in Sri Lanka. The Bank has won multiple international and local awards in 2016 and 2017 and 20 international awards in the first eight months of 2018.